Bring the water to a boil, add tea bags and brew for 2 minutes. Remove tea bags and chill. Purée all remaining ingredients in Bamix to a smooth purée. Pass purée through a sieve and chill. Fill glasses with ice to chill. Fill cocktail shaker 1/3 with ice. Pour equal quantities of chilled tea and kale purée into the cocktail shaker. Shake to mix. Discard ice from the glasses. Fill 3/4 glasses with fresh ice. 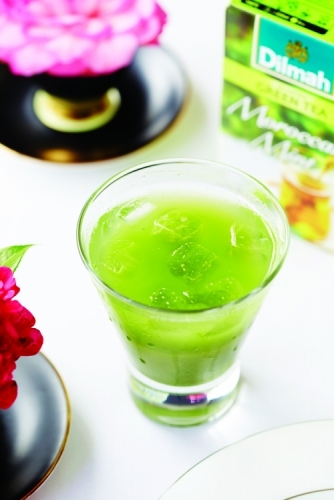 Pour mixed mocktail into glasses and garnish with mint leaves.